The Four Seasons Hotel in Sultanahmet opened a few years ago on the site of a former Ottoman jail dating from around 1918. The prison was later used as a military jailhouse. Contrary to some sources, it was not the prison where Billy Hayes from Oliver Stone’s 1978, Midnight Express (directed by Alan Parker), was sent. 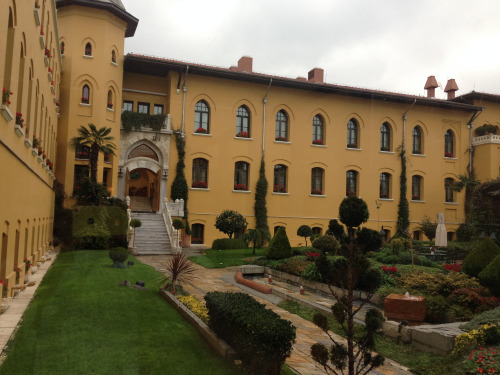 Despite maintaining certain architectural features of the prison, the feeling on entering the hotel is that as much as possible has been done to celebrate all aspects of Turkish culture and heritage EXCEPT that of its prisons. So where publicity around the former carceral site – including that which reframes it as part of cinematic history it doesn’t really belong to – has no doubt piqued interest in the hotel, efforts have clearly been made to prevent this interest in the hotel’s architectural history from making guests paying $450 a night for a room feel any sort of uneasiness about their stay. One exception to the erasure of the carceral within the hotel itself was the ‘prison’ cocktail on the menu (pictured below). Evidence perhaps of the persistence of the carceral as something to be consumed and the role of alcohol in facilitating ‘dark’ tourism as a transgressive pleasure for those who can afford it. This is just one of a growing number of former prisons and jails which have been converted into hostels and hotels. See: http://www.independent.co.uk/travel/hotels/prison-hotels-sleep-in-a-cell-or-eat-in-an-old-exercise-yard-10299283.html for more examples. There has been controversy surrounding some of these conversions particularly where the prison attests to a recent traumatic history of incarceration for the local community (as was the case with the decision to turn Armagh’s Women’s Gaol into a hotel and spa). Where hostels like the Fremantle YHA in Australia and Ottawa Jail in Canada celebrate the carceral history as a form of themepark, the assumption that a museum commemorating the space is a more sensitive and socially responsible repurposing of such sites needs further analysis.